Dr. Christina Gillenwater is now practicing at Flatwoods. A graduate of Marshall University's Joan C. Edwards School of Medicine, Dr. Gillenwater has practiced at Community Care's Clay health center for three years. Appointments are already being scheduled. Dr. Gillenwater is accepting both transfer and new patients. Community Care of Flatwoods offers an array of medical services including comprehensive primary care and chronic disease management, and pediatric services. For acute, non-life-threatening illnesses and injuries, CareXpress is located two doors down and is open seven days a week. 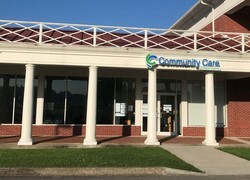 CCWV has also partnered with Carl Walker's Drug Store, in Gassaway, to provide our patients with access to medications through the 340B discount drug program. ​Community Care of Flatwoods has received a Level 3 accreditation — the highest possible — from the National Committee for Quality Assurance (NCQA) for providing exceptional service and high quality care.